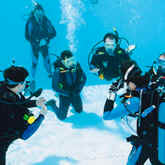 Instructors and Divemasters have long recognized the need for a buoyancy training program which improves safe diving practices and promotes environmental awareness. Divers often think that if they don't crash to the bottom like a rock, or pop to the surface, they have good buoyancy control. The Diamond Reef System is a buoyancy training program that utilizes a modular, artificial reef that gives you a way to measure your buoyancy proficiency. 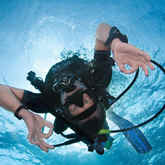 Through the Diamond Reef Buoyancy System, certified divers will learn to be more aware of proper ascent rates, horizontal hovering, breathing and subtle body movement techniques to control, and be shown what their swimming cross section really is. This pool course will teach you the basics to improve your buoyancy control skills and increase your environmental impact awareness. Course Fee: $69.95 -- includes all scuba equipment needed (Please bring your own mask, fins, and snorkel for maximum comfort).